Our team at Morrow, Lai & Edwards Pediatric Dentistry know that as more families turn to bottled water and away from the traditional tap, they may be missing out on one important ingredient that most brands of bottled water fail to include: fluoride! For more than 60 years, water fluoridation has proved to be a safe and cost-effective way to reduce dental caries. Today, water fluoridation is estimated to reduce tooth decay by 20- to 40 percent in children who have access to fluoridated toothpaste. Bottled water, however, which remains one of the more popular drinks in the world, may not contain any fluoride, which is known to help prevent and even reverse the early stages of tooth decay. The majority of bottled waters on the market do not contain optimal levels (0.7-1.2 ppm) of fluoride, according to our friends at the American Dental Association, or ADA. Many dental health specialists suspect bottled water’s increased popularity as the culprit behind rising rates of cavities. 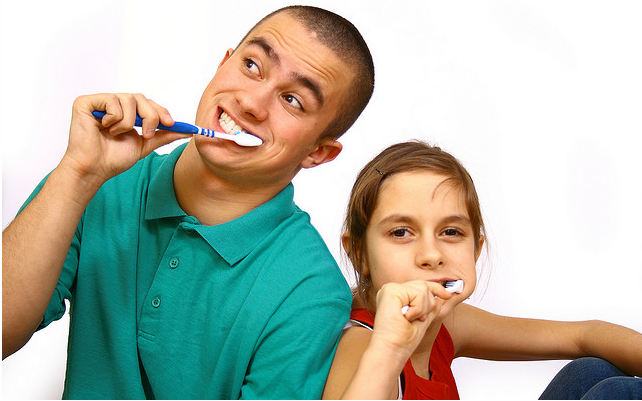 Because fluoride helps strengthen teeth, it is an important component of maintaining good oral health. So if bottled water is your water of choice, be sure to check the label to make sure that your brand contains fluoride. As of a 2006 decision, the Food and Drug Administration, or FDA, allows bottled water containing .6 to 1.0 milligrams per liter (parts per million) of fluoride to carry a label stating that fluoridated water may reduce the risk of dental cavities or tooth decay. The ADA has backed this decision. Of course, simply drinking fluoridated water is not a magic ticket to perfect teeth. To keep your pearly whites in tip-top shape, it’s important to brush and floss daily and avoid sugary sweets, in addition to maintaining your fluoride intake and visiting Dr. Mark Morrow, Dr. April Lai, and Dr. Kerry Edwards and our team at Morrow, Lai & Edwards Pediatric Dentistry regularly!